The last of the garden kale (Brassica oleracea var. acephala ‘Cavolo nero’) clings on and needs harvesting before falling to flowering and a spring onslaught of cabbage moth and aphids; fat hen (Chenopodium album; ‘lamb’s quarters’ or ‘goosefoot’ to some) is coming through all over the place (plenty enough in vegie gardens to weed it from where you can best trust dirt); the self-sown seed amaranth (Amaranthus hypochondriacus) that is now essentially a weed in my allotment (and, embarrassingly my fault, some neighbouring ones) is practically leaping out of the ground; the native spinach (Tetragonia tetragonioides) along the coast is flush with tender new growth. They are thrown in a pot together to boil, then cooled, squeezed out, chopped and frozen in blocks, each one a roundup of the world of people and plants, with the various components in them being: from all around the world; from across the full spectrum from wild to highly selected cultivar grown from carefully tended seed; from different botanical families (if we can sneak the chenopods back out of Amaranthaceae) but all commonly compared to spinach (which ironically went to seed unharvested in the herb garden outside the front door). And for those reasons alone I post on this otherwise fairly unremarkable harvest of kitchen greens. Native spinach (Tetragonia tetragonioides): A wild plant from much of the Pacific rim although most associated with Australia and New Zealand; cultivated occasionally there, rarely in Europe and commercially in Brazil; but in my case wild and flourishing in huge stands along Sydney’s coast. 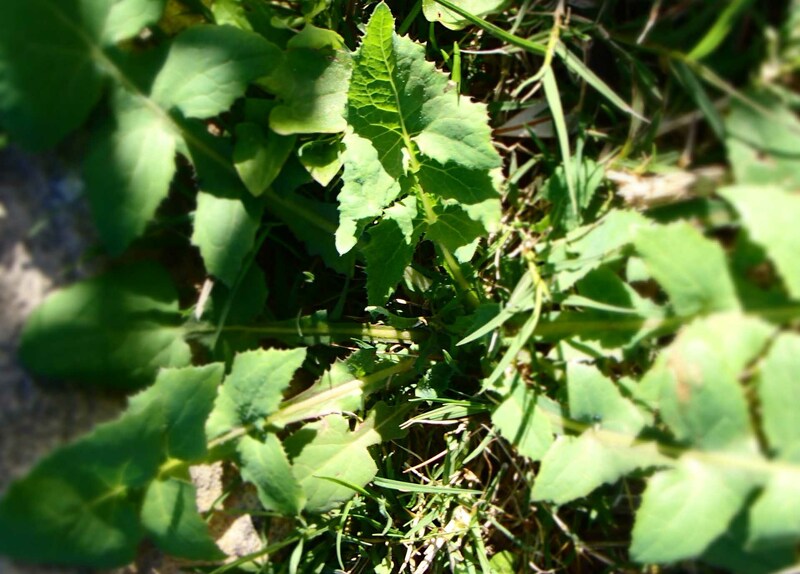 Fat hen (Chenopodium album): While grown commercially in India at least and related to quinoa (whose grain is a South American staple), this is resolutely considered a weed across much of the world. Grain amaranth (Amaranthus hypochondriacus): Amaranths were a staple crop of pre-Columbian America, popular in India and Greece and include species that range from valued food to despised weed; I grew some of this type as an experiment a few years ago and now just harvest whatever pops up – so it is both crop and weed to me. 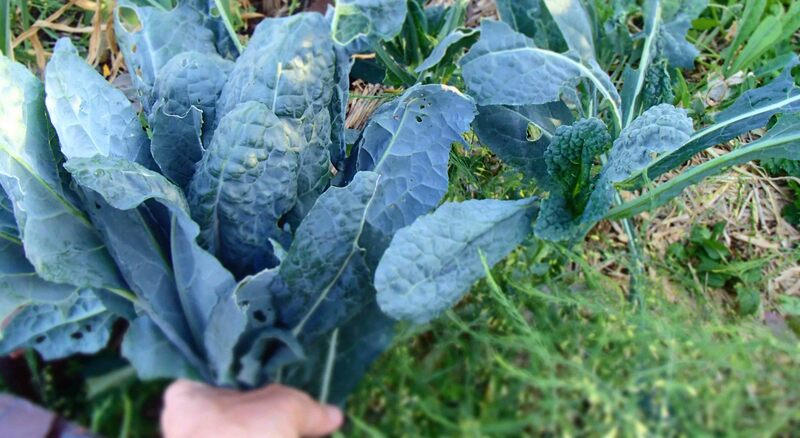 Tuscan kale (Brassica oleracea var. acephala ‘Cavolo nero’) is about the only cooking green I grow on purpose (thinning out young beetroot excepted); a carefully selected cultivar carefully tended from seed imported from Europe and grown determinedly in rows for the better part of a year. Today, feeling the need for a healthy soup and having the time for a quick forage near home, I took a bucket and knife to the park to pick what might be best be called a mess of hot greens. There were seven of them, none picked further than 200m from the flat, and all considered to make at least some sense for a soup with onions, potato and buttermilk (or sour cream); the kind of thing where either spinach or cress might first come to mind. The mix was only partly planned, with some mind given to how much was peppery, how much could be bitter and how much plain spinach-like bulk it might need. Beyond that, any basket of wild greens this diverse would likely never be the same twice and end up always somewhat arbitrarily based on mood, location and season. I don’t know a lot about the different herbal healing and healthful properties of all the plants involved, but I do know that they are there in varying degrees. I also know that all of these greens are ones that you can overdo; in terms of flavour (bitterness most particularly), potentially unhealthy side effects (like excessive oxalates and saponins), or both. And I am absolutely convinced that all wild greens should be consumed in diversity, small amounts at a time, and fairly regularly. In Michael Pollan’s In Defence of Food: An Eater’s Manifesto he offers one particular overriding piece of dietary advice: ‘Eat food. Not too much. Mostly plants”. To this I would add (if he hasn’t himself in the follow up Food Rules): ‘as many different types in small amounts as you can’. When our Boy first went onto solids, and as parents busy with other jobs as well, we made up batches of baby food and froze it in muffin trays. As an ignorant first-time parent, there was only one thing that always went into every one of those mixes – a minimum of 6 species, preferably more. I’m certainly not suggesting I am a go-to-guy on baby feeding, but rather that I think diversity is a way to get by with limited detailed nutritional knowledge (in a culture still trying to find its way back from babies eating whatever they put in the jar). When your diet gets as diverse as a really good diet should be (double figures for contributing species number in every meal, as my guide), it is enough to know how to make it all come out tasty without being able to repeat its full nutritional profile. Sow thistle (Sonchus oleraceus) is a plant I have little experience with, but it seems to have some popularity as a wild green in North America (see here, here and here) and in New Zealand (here) where a native species (S. kirkii) is a traditional Maori food known as puha. 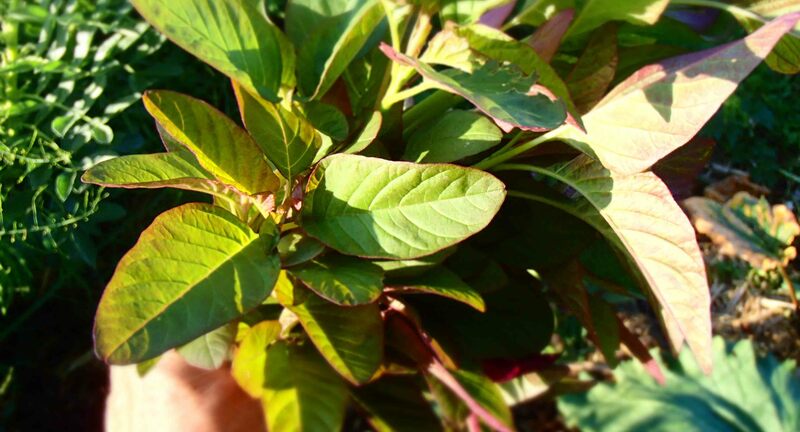 Native spinach (Tetragonia tetragoniodes) is something that I have written on before as having limits to its nutritional utility but would certainly still rate as an excellent inclusion in a ‘mess’ for its solid spinach-like reliability. There is quite a lot of bitterness and pepperiness in the other greens that might want some taming, so the whole mess is at least ¼ native spinach. I have previously written of chickweed (Stellaria media) as the ‘the winter green’ – but obviously it is not the only one, particularly if cooked greens are included. The stuff I gathered almost got involved incidentally, not being a first thought for soup, but it was growing in among native spinach and sow thistle and practically begging to be included. 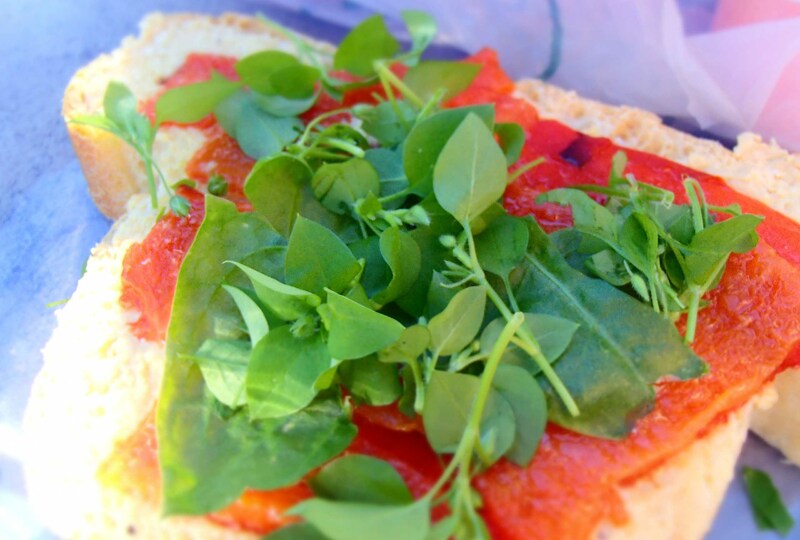 Watercress (Nasturtium spp.) is doing really well at the moment and there are some good spots near us on the coast where clean water filtering out of sandstone seeps makes it easier to trust than where it might be in any old storm water runoff. Nasturtium (Tropolaeum majus) you may notice has a common name that is actually stolen from the botanical name for watercress. It is Latin for ‘nose-twister’. Its other common name of Indian cress continues the obvious theme of the two plants being pretty similar on the palate, despite being unrelated. I have yet to test them out head-to-head and am happy enough with just a bet each way at this stage. I am not the fan of dandelion greens (Taraxacum officinale) that some foragers are, probably because I don’t like bitter very much. People say you just have to get it at the right time; just as it is unfolding at its tenderest (and even then it has some bitterness); but without an obvious enough spring here in Sydney, I have got it wrong just a few too many times to keep trying. Still, I have no doubt that it is good for me and have no problem with it cooked in a ‘mess’; diluted basically. Wild mustard greens (Brassica spp.) can be bitter, except for a brief window in spring (according to Euell Gibbons in the American foraging bible Stalking the Wild Asparagus), so I have always gone pretty light on them as a leafy green. I will leave it to another occasion to go into the more interesting uses of picking enough of the little clusters of flower buds to have some peppery mini-broccoli, and the gathering of ripe pods to dry and extract mustard seeds from. Recipe: Onions (and leek if I had it) are sliced thin and cooked low until softened, garlic added for the same purpose but with a little less time; add a little spice (smidgeon of nutmeg, chilli, cumin, coriander – again, little skerricks of diversity) and some chopped potatoes (and other roots if you like – I had a parsnip to spare) followed by stock (or just water if you want to add miso later instead) and then the greens (keeping back a little bit of the cress); simmer for 20 minutes (yes this is a long time to cook your greens if you are going healthy, but some of the bitter ones want it and you are hopefully making up for any losses by there being so much of the stuff); let it cool slightly, blend (having added any cress that you previously held back) and stir in buttermilk or sour cream. Garnish including a sour cream dollop) and season as takes your fancy (this is actually where I add my sea lettuce and salted fish roe because the Squeeze is a seaweed disliking proper vegetarian); and serve. 7 weeds and potato soup, garnished with sour cream, sea lettuce and salted fish roe. When most of the wild greens are gone for the winter, chickweed (Stellaria media) will always provide. You can’t stop it if you try. To be honest, like a sterotype child I sometimes have to be forced to eat my greens, even if it is me who does the forcing. So here is how it works: I make a sandwich and head out the door, grab a handful of chickweed from the current wildness of the shared apartment block herb garden and throw it in. In the picture below it is with burningly garlicky hummus and marinated roast capsicum made on the weekend. The Squeeze bakes the bread. Time out of my day: 15 seconds. Foraging is in the spare time; now it’s time to get a kid to daycare and me to a desk, but 15 seconds I can obviously do. 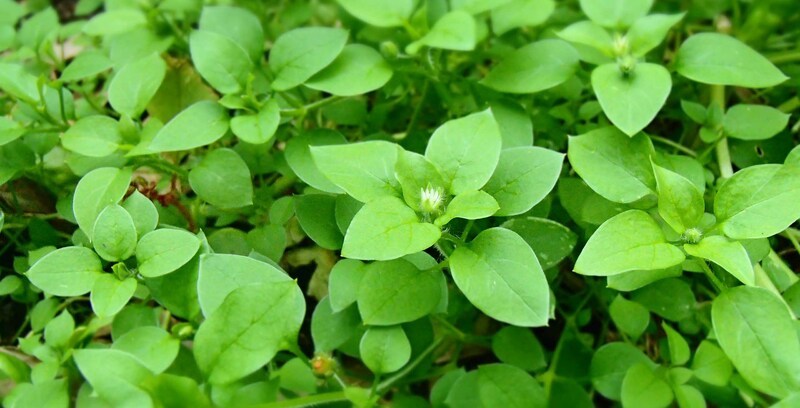 Chickweed is yet another one of those surprisingly under-utilised foods. Many vegetable gardens would have more of this taken out as a weed over winter than conventional vegetables (at our community garden there is something of an unwritten rule that at least it goes to the chickens – who adore it). It is juicy, tender and mild, with a favour from close to nothing to having a little tart edge to something that does somehow manage to be an undefined taste of a weed. Or perhaps that is just the taste of raw greens – like I say, I’m no connoisseur. Richard Mabey (in Food for Free, the indisputable British wild plant food bible) prefers it simmered and finished with butter, lemon juice and seasoning including a little nutmeg, as an accompaniment to rich meat. The Cribbs (in Australia’s equivalent bible Wild Food in Australia), also describe it as mild and benefiting from butter and lemon. Earthwise Herbal will tell you that is close to a heal-all. Ted Manzer, botanical font that he is, will tell you just about anything you might need to know about it (here). Me, I don’t know much, except that if I can bring some very healthy fresh greens to my diet with it, most people can.